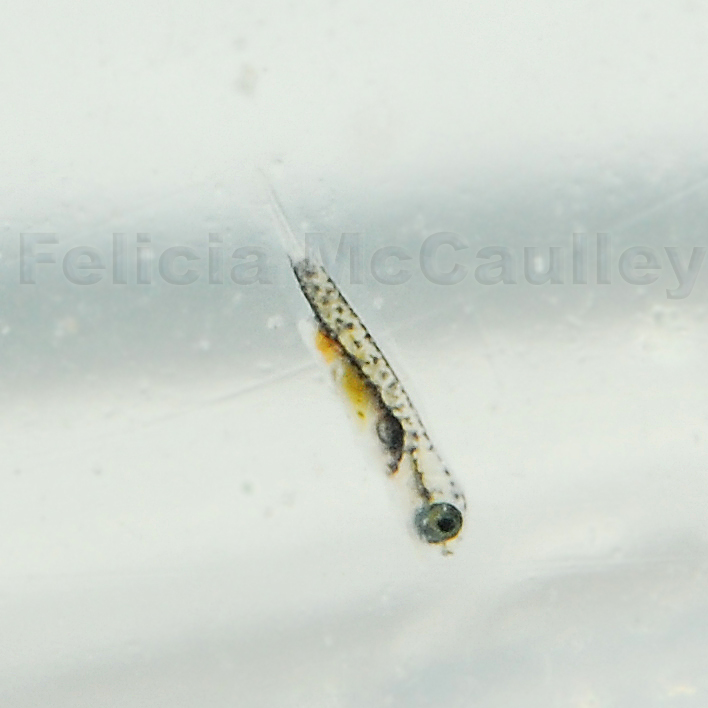 Last Friday I brought home some Clingfish larvae from work (The Hidden Reef in Levittown, PA), probably Gobiesox punctulatus. Of course, my rotifer culture that I’ve had for months crashed without warning as they are likely to do in the hands of busy people, and I was worried I would lose all my Gobiesox larvae. I’ve been giving them newly hatched, decapsulated Artemia (baby brine shrimp) every 12 hours, siphoning out the uneaten, older artemia first. 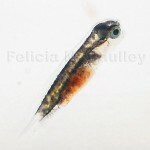 I add DT’s Phytoplankton to the fry bucket as often as I need to tinge the water green. This helps the fry see their prey and keeps the Artemia nutritional profile higher. I have about 40 out of 100 Clingfish larvae left, and about 15 are obviously larger and have more dark pigment than all the others. 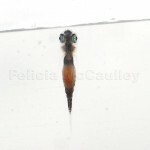 I just got some Moina salina and more rotifers from Seahorsesource.com today. I’m going to give both to the larvae and see if the smaller ones start to catch up in growth to their bigger siblings. Here are some photos of a 4 day old Clingfish larva with Artemia in its gut, and 2 photos of a 7 day old Clingfish with Artemia in its gut. The first is a side on view, and the second is a shot of the underside of the larva. Stay tuned to ReefTools.com for more updates!